So my son just turned 18 years old (sniff, sniff) and I wanted to do something a little fun for one of his gifts! He mainly wanted money for his birthday because he is saving like crazy for college expenses for next year. 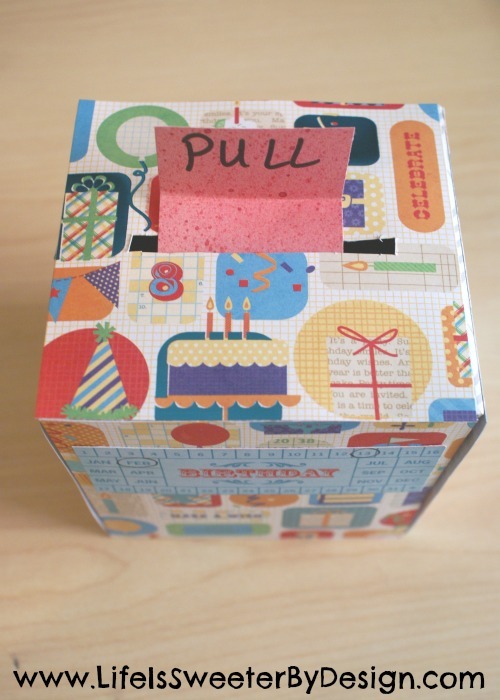 I decided to make an easy and fun DIY to give him his birthday cash gift using a tissue box! 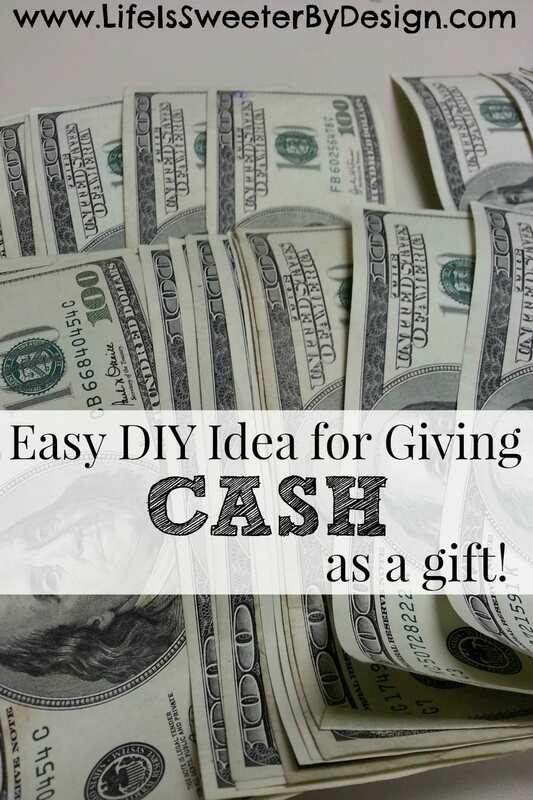 I was looking for ideas on fun ways to give cash as a gift and found a simple tutorial over at Redefined Mom that got me started! This is a pretty simple idea, but makes giving cash a lot more exciting! First you will need to take the tissues out of your tissue box. 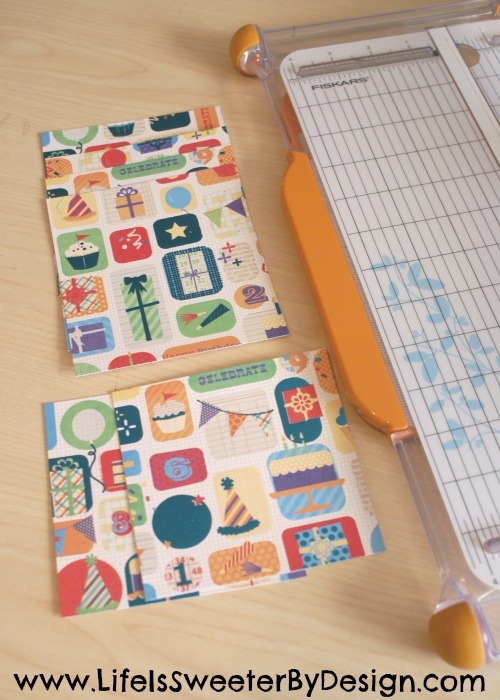 Next you need to cut your cardstock paper down so that you have a piece for each side of the box. You will need 4 pieces that are the same size for the sides and then 2 pieces that are the same size for the top and bottom. I used some cute Birthday Cardstock from the DCWV Celebration Stack. This stack also has some cute little cards that you can cute out and put on the sides! Now I used some strong double-sided adhesive to adhere the cardstock to the tissue box. I did the bottom and all 4 sides and left the top off for now. 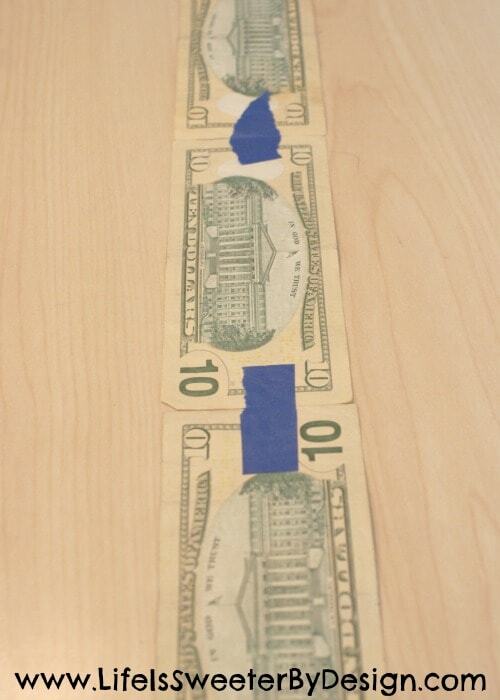 Next I decided to tape the money together. 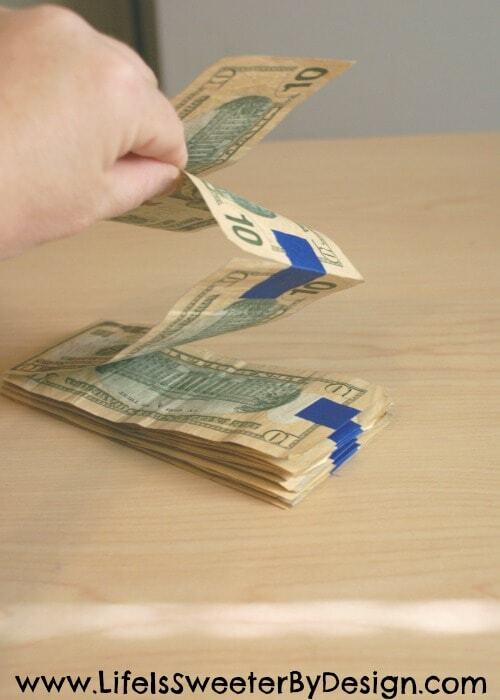 You will take the bills end to end and then fold them up like an accordian…back and forth so that when they pull the money out it just flows out perfectly! Take the last piece of cut cardstock that is for the top and cut a small slit slightly larger than the bill. I just used scissors to cut this opening. I took a small piece of cardstock and wrote PULL on it and taped it to the end of my first bill. 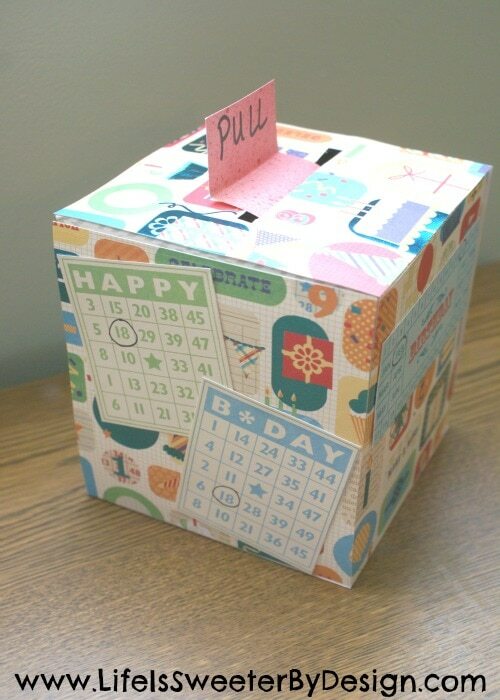 Then I put the money into the tissue box with the PULL tab sticking out the top. I pulled the PULL tab through the slit in my last piece of cardstock. Then I adhered the last piece of cardstock to the top. To make sure that my PULL tab didn't fall back down into the box I decided to fold it on one side and put a tiny bit of adhesive so that it stayed in place until time to PULL! I used some of the cute cards in the Celebrations Stack to add some extra decorations to the sides of the box. This took me about 30 minutes to make and I think it was well worth it! 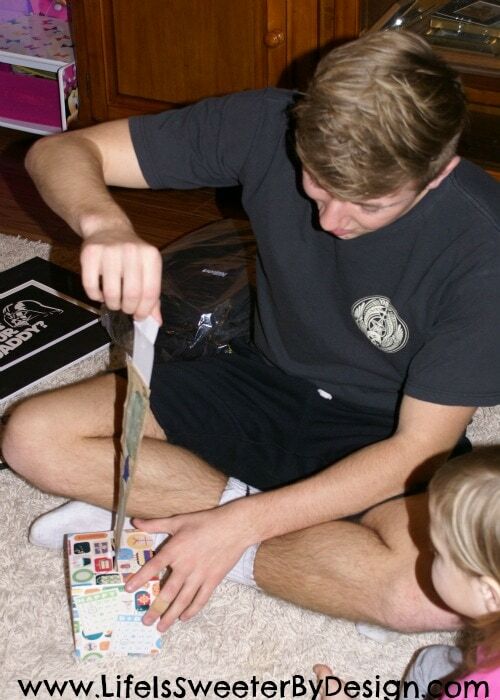 My son was really loving pulling all that money out of the box…it just kept coming and coming! 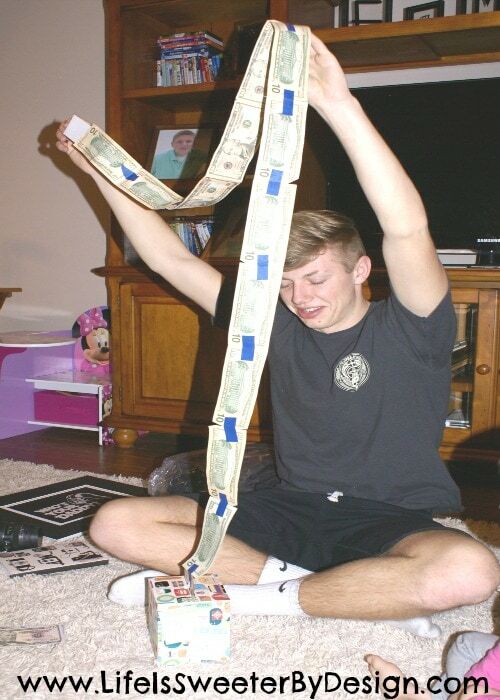 I decided to give him a $10 bill for every year old his life…so he got 18 $10 bills! 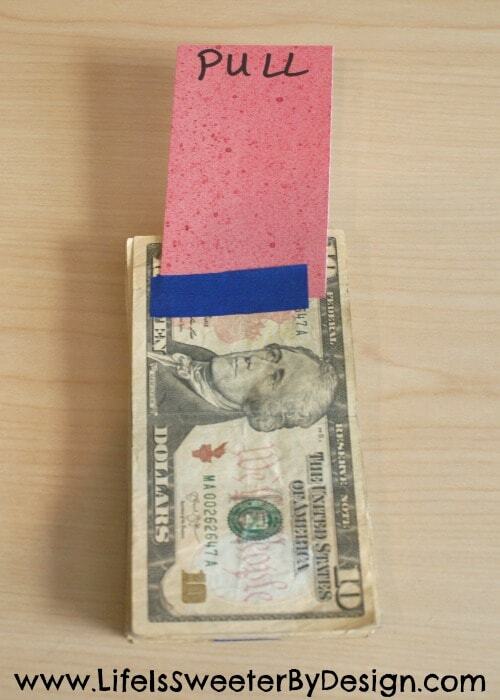 Obviously you could do this with $1 bills too! It would be a fun idea for someone's 50th birthday….to give them 50 $1 bills! 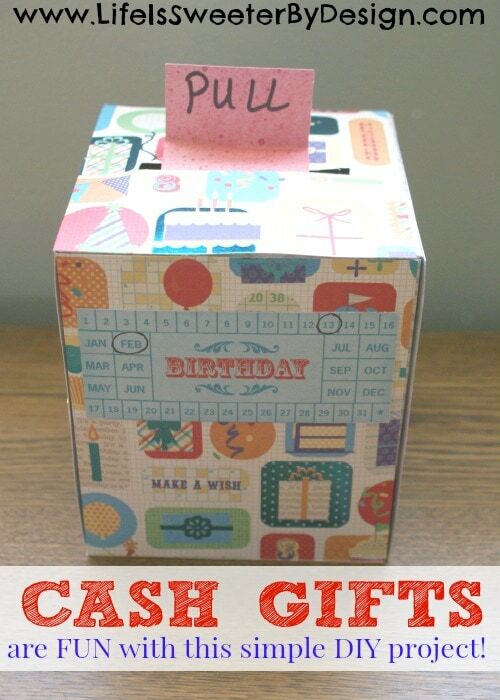 What is your favorite fun ways to give cash gifts? 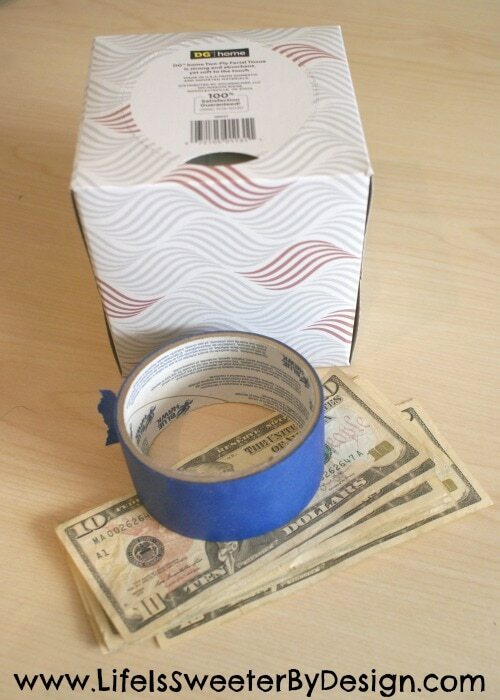 Have you ever tried doing a cash gift using a tissue box? 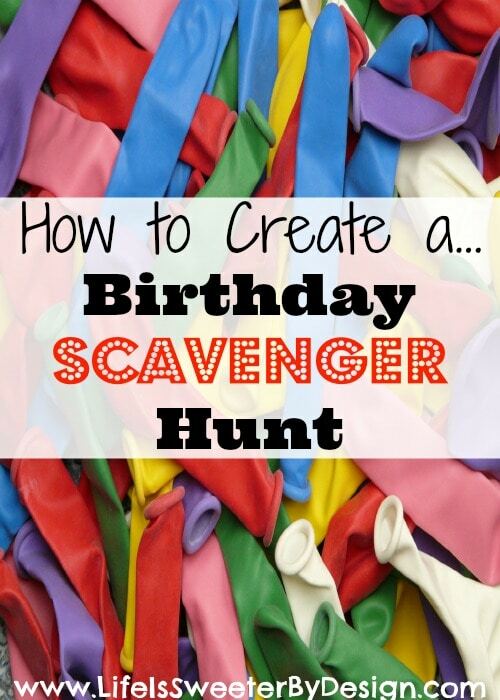 Be sure to read about how to create a Birthday Scavenger Hunt for your next family party! such a unique thing to do.